Erythritol, stevia and xylitol are all zero-calorie or low-calorie alternative sweeteners. They each have unique benefits that make them desirable compared to other artificial sweeteners, many of which have a reputation for causing detrimental side effects. However, beyond the similarities, these alternative sweeteners are fairly different from one another — even the ways that erythritol, stevia and xylitol should be used and how much should be consumed vary. Erythritol has a glycemic index of zero and a caloric value of 0.2 calories per gram, essentially making it noncaloric. This sweetener is made via fermentation from glucose and sucrose to create a product that's about 70 percent as sweet as sugar. Erythritol is one of the most popular alternative sweeteners to normal sucrose-based sugar as it has no aftertaste and mixes well with other foods. There’s no need to create specific recipes using erythritol — just swap it for the equivalent amount of sugar. Erythritol is a polyol, a type of carbohydrate that's hard for your body to digest and is consequently excreted in urine. Since your digestive system can’t absorb erythritol, too much can cause gastrointestinal side effects; however, these are minimal in comparison to other alternative or artificial sweeteners. This sweetener’s lack of side effects and flavor means that erythritol can be substituted for sugar better than most other alternatives to standard sucrose sugar. It also acts as an antioxidant and can improve oral health by preventing bacterial growth. The primary downside to erythritol is that it’s difficult and costly to produce, compared to other alternative sweeteners, including other polyols. Xylitol is a crystalline sugar found in a wide variety of fruits, plants and microorganisms. It’s been marketed for over 100 years and became popular during World War II when sucrose was hard to acquire. Birch xylitol and other hardwood-based forms of xylitol are the traditional forms produced. Nowadays, though, commercial production varies, and plant waste is often used to produce this alternative sweetener, making it quite an ecologically friendly product. Unlike other sugars, xylitol can’t be fermented in your mouth, which means that choosing products with xylitol rather than other artificial sweeteners can help improve your oral health and reduce the formation of cavities. Xylitol does this by balancing the pH (acid-alkaline levels) in your mouth. Unlike other sugars, xylitol can’t be absorbed by your gut, and it produces minimal energy. This means that it doesn’t cause the same insulin production response when digested, making it a suitable sweetener for people with diabetes. Xylitol has a glycemic index between 7 and 13 and a caloric value of 3 calories per gram. The same positive aspect — indigestibility — of xylitol is also its primary negative. Like other indigestible sweeteners and polyols, xylitol has been known to cause gastrointestinal side effects. These include cramps, bloating, gas and diarrhea. If you have food allergies, be careful when purchasing xylitol, since it can be made from any one of these products or a combination. Xylitol can also be produced by microorganisms like yeasts, bacteria and fungi. The method used to produce xylitol from plants versus microorganisms is slightly different, but the end product is the same. You can find xylitol in all sorts of products, from chewing gum to candy to toothpaste. It's not typically used in beverages or for cooking as its consumption should be limited on a daily basis due to its gastrointestinal side effects. Stevia is an alternative sweetener from the South American plant Stevia rebaudiana, a type of sunflower. These days, stevia is grown all over the world in countries like Paraguay, Kenya, China and the United States. It requires very little land, water and energy to grow, making it an ecologically friendly and affordable crop that can be grown in most of the world. The word stevia typically refers to sweeteners sourced from the stevia plant, rather than a brand or exact product. Stevia has only been popular for the last 50 years, making it a fairly new alternative sweetener. It has been shown to have positive health benefits, including lowering blood pressure and making it easier for people with diabetes to improve their nutritional status. Stevia is safe and healthy to consume, even though it’s so much sweeter than sugar. It actually contains beneficial nutrients, like proteins and minerals, that remain if you choose to consume stevia plant powder or leaves, rather than the sugar substitute. Unlike sugar, stevia doesn’t accumulate in the body or produce energy; it passes through the gastrointestinal system and is excreted in urine. This essentially means that stevia is a zero-calorie sweetener. Even though stevia has no calories, you shouldn’t consume it in excess. Since stevia products can vary, the acceptable daily intake is based on steviol glycosides: 12 milligrams of stevia extracts per kilogram of body weight. However, this means that the average adult would have to consume nearly a gram of steviol glycosides per day to reach the limit — quite a lot since this sweetener is so much sweeter than sugar. This makes stevia a good alternative sweetener to use in ice creams, baked goods, alcohol, soft drinks and other products. The main downside to stevia is its slightly bitter, licorice-like aftertaste. It has no harmful effects or side effects. In fact, specific steviol glycosides, like stevioside, act as antioxidants and can help reduce inflammation and improve immune function. 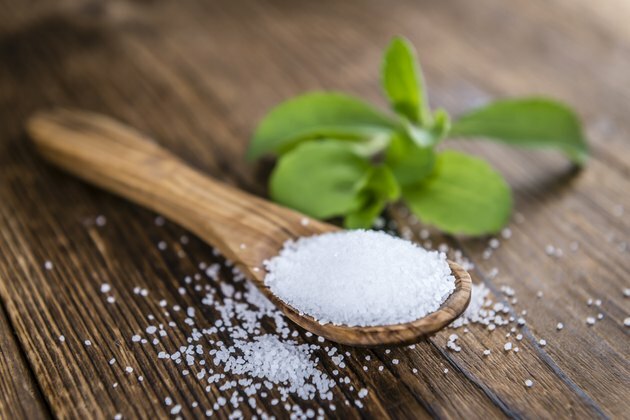 Unlike other alternative sweeteners, stevia has been linked to a variety of health benefits, including antiviral, anti-cancer and antidiarrheal effects. Erythritol and xylitol are fairly similar on a chemical level as both are polyols. This means that the way they act in the body and their side effects are similar. The main difference is that you can consume more erythritol than xylitol; in excess, they’ll produce the same gastrointestinal side effects. As an ecologically friendly and low-cost product, however, xylitol is a better choice: it can be easily made from a wider variety of plants and from plants that would otherwise be considered waste. Xylitol and erythritol vs. stevia is a much more complex comparison. Objectively, stevia is better as it’s a zero-calorie sweetener compared to xylitol and erythritol, which are both technically low-calorie sweeteners. Stevia is also usable as a whole plant and more natural as a product, typically with considerably less processing involved. This means that you can obtain a variety of products, ranging from stevia plant powder to the high-intensity sweeteners that can be extracted from it, rather than only the crystallized versions available for xylitol and erythritol. Stevia also has no major side effects and a myriad of health benefits in comparison to xylitol and erythritol. However, when it comes to cooking, erythritol vs. stevia aren’t comparable. Stevia is much more like xylitol — an ecologically friendly product that is useful in specific food products. The fact that stevia is so sweet means that you can’t use it the same way you would use sucrose or erythritol, resulting in the need to modify recipes. It also has a strange aftertaste that could be compared to licorice — a somewhat bitter flavor that could be considered undesirable for everyday use. Stevia, xylitol and erythritol aren’t the only alternative sweeteners available, but they are some of the best low- to zero-calorie options. They also have some of the best health benefits for alternative sweeteners. Several other alternative sweeteners are available that are nutrient-rich and come from natural sources, like fruit-based sweeteners, including monk fruit powder and lucuma powder. These fruit-based alternatives may be safe for diabetics, but unsuitable for people adhering to a specialized diet like the ketogenic or other low-carb diets. Applied Microbiology and Biotechnology: Erythritol as Sweetener—Wherefrom and Whereto? Can Splenda or Equal Raise Your Blood Sugar?